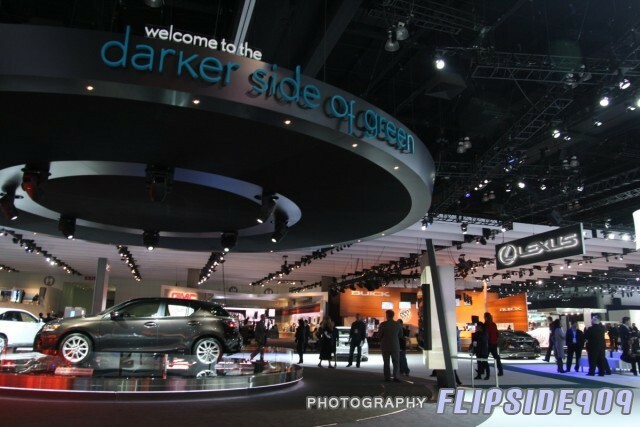 November 17, 2010 – Los Angeles, CA – Its that time again as the major auto show season in the U.S. kicks off at the 2010 Los Angeles Auto Show. There are more than 50 new vehicle debuts, including two major announcements from the Toyota camp. The first is the introduction of the Toyota RAV4 EV powered by Tesla. This is their second interpretation of the RAV4 in Electric Vehicle form, although it is the first collaboration with Tesla Motors. This RAV4 EV will have a driving range of 100 miles in various types of driving patterns and climates. The general exterior stays the same. 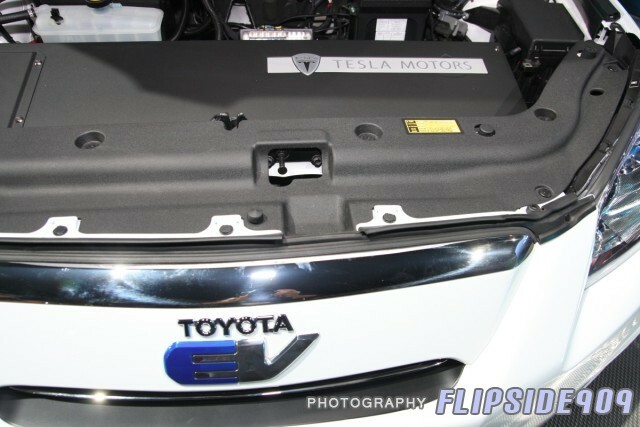 However, the front fascia sports a distinctive grille with an electrical plug-inspired EV logo on the nose. The inside remains virtually unchanged, but the gated gear shifter in the center column is replaced by a push button-type drive selector. Initially, Toyota and Tesla plan to build 35 units for 2011 and projects to roll out full production versions in 2012. It is yet to be determined where Toyota and Tesla will build this, but my guess is that they will continue to build the RAV4 in Canada at the TMMC plant in Cambridge, Ontario with the electric powerplants being sourced from Tesla’s new facility in the Bay Area (in Palo Alto, California to be exact). Another possibility would be the revival of NUMMI in Fremont, California, which would thus get its second wind. Only time will tell if the former Toyota/GM joint venture facility will be the new birthplace for the RAV4 EV. During Jim Lentz’s presentation, they rolled out video of the RAV4 EV in motion. At first glance, it reminded me of a Honda CR-V but I’m fairly certain it was not their intent. Elon Musk, Tesla’s CEO, was also present during the press conference. In its 4th production year, the tenth-generation Corolla receives a refresh. Unfortunately, the luxurious but slow-selling XLE and more powerful XRS are dropped in favor of simplifying the trim levels to only three. The base CE, value-packed LE and the sport-themed S will be the the choices. 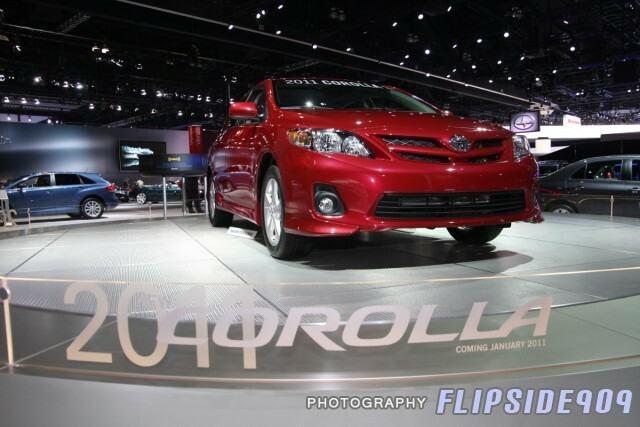 The redesigned Corolla receives minor exterior changes to the front and back as well as interior updates. Notably, the steering wheel has been upgraded to have a better, sportier appeal. The new radio has a trick new dot-marix display which is similar to what’s found in newer Toyota models. Gone is the generic backlit Toyota green LCD display. Overall, the new updates are pretty sharp. However there as there are obvious hints of Yaris and Camry in the front. I’m saddened that Toyota decided to kill the XRS model, as this held some hope that the Corolla would be a worthy contender in the sport compact market. Bad move, in my opinion. Adjacent to the Toyota display, Scion brings out their three-story cage with a host of the usual custom, tricked out variety of xB, xD, tC and concept iQs. A new Scion iQ was displayed on the floor with the 2010 SEMA tC project cars, the new xB Release Series 8.0 in a vibrant Voodoo Blue and a various xD models both stock and modded. Scion continues to lead the way by offering four value packaged models which appeal to different tastes. With a strong aftermarket presence, buyers can customize their Scion to stand out from the rest. Lexus comes on strong this year with their focus on hybrid technology. Lexus is the world leader in luxury hybrids as they show off three customized SEMA project cars at their floor this year. The race ready 0-60 Magazine GS 450h, VIP Auto Salon’s HS 250h and their modern luxury LS 600hL are showcased in the front row. The Darker Side of Green makes its way to Los Angeles for the first time with the new CT 200h in a rich Fire Agate Pearl. 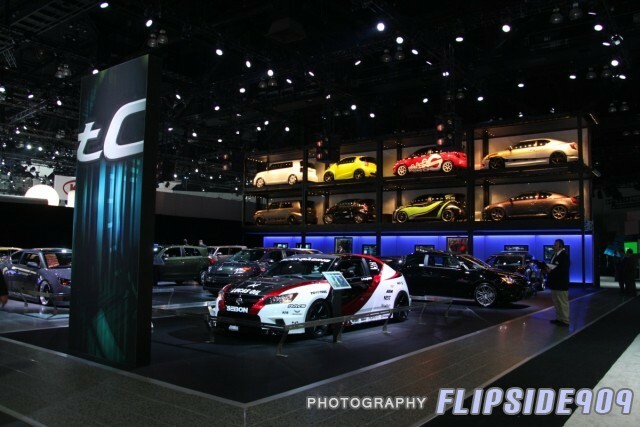 The Smoky Granite LFA which was recently showed at SEMA in Las Vegas and flogged around Monticello Raceway in New York just this past Saturday made it just time for the opening of the LA Auto Show. A fully optioned Starfire Pearl IS 350 F-Sport was parked next to the LS 460 Sport. New for this year’s show is a huge LED display which nearly stretches the whole width of the Lexus display area. The vibrant display draws your attention from afar as different Lexus models are flashed on to the screen. 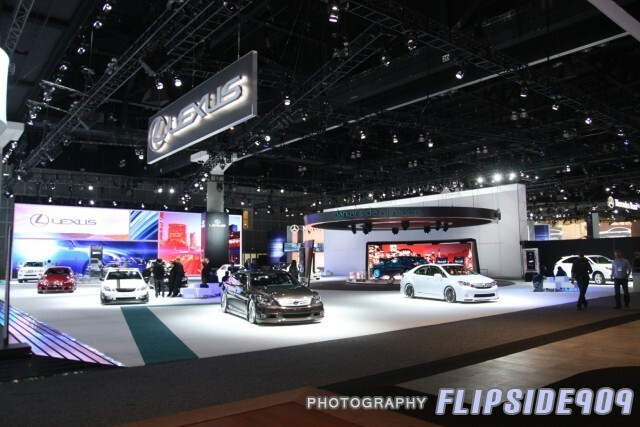 You can find Lexus strategically sandwiched between the Audi and Mercedes Benz displays in the South Hall. More photos to come! 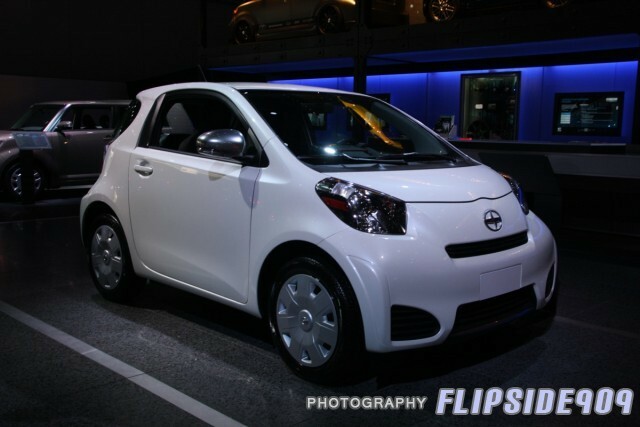 This entry was posted in CT, Hybrid, LA Auto Show, Lexus, LFA, RAV4 EV, Scion, SEMA Show, Tesla, Toyota by Flipside909. Bookmark the permalink.